Not many people get a second chance at creating a career. So when Leslie Foster got her second chance, she didn't waste it. "It was pure accident," she explains. "Not too often do you hear about a cop turned baker." It all started in the mid-2000s, after an injury forced Foster to retire from a position with the Portland Police Bureau. After taking a few classes in design and architecture, she wasn't sure what direction she wanted to take her life. But when she decided to employ the help of a friend in making a cake for her then-2-year-old daughter, she discovered a passion for creating decadent and grandiose cakes. "I was a single mom, and I looked at these elaborate cakes, these $200 cakes, and said, 'That's what I want,'" Foster says. "I didn't have that kind of money, so I sat down and got to work." From that first cake, Foster was hooked. She started taking classes at the Decorette Shop in Portland, and by word of mouth, tales of her confectionery acumen spread among friends and family. One-by-one, they started asking her to make them cakes for weddings, birthdays, graduations and other events. With all that practice, Foster's skills continued to grow to the point that she decided to make the leap from amateur to professional. In 2008, she established her first cake business out of her northeast Portland home, Stumptown Cakes. "I was taking classes, but it wasn't long before I became the teacher," she says. "I took a gum-paste flower class and they were looking for a new teacher. I was pretty good at it, so I stepped up." Teaching only helped to improve her skills, and in 2009, Foster completed her first three-dimensional cake for a friend who was having a baby boy. From that point, Foster's love for 3-D cakes and sculptures exploded. She took on more clients and started letting her creative imagination run wild. By 2012, Foster was completing elaborate cake pieces and submitting them to competitions across the West Coast. She also got involved with the cake decorating competition at the Oregon State Fair, which she began to help organize as well. She soon outgrew her space in Portland — not only because of the business, but also because she remarried and had another child. So Foster decided to search for a new home, eventually settling with her family in West Linn, where she now operates The Cake Room. Over the past several years, Foster has made quite the name for herself in the cake decorating world, having won several competitions and being published in magazines such as American Cake Decorating. Most recently, Foster was honored at Washington State Sugar Artists, a cake and confectionery show held in Everett, Wash., in May. 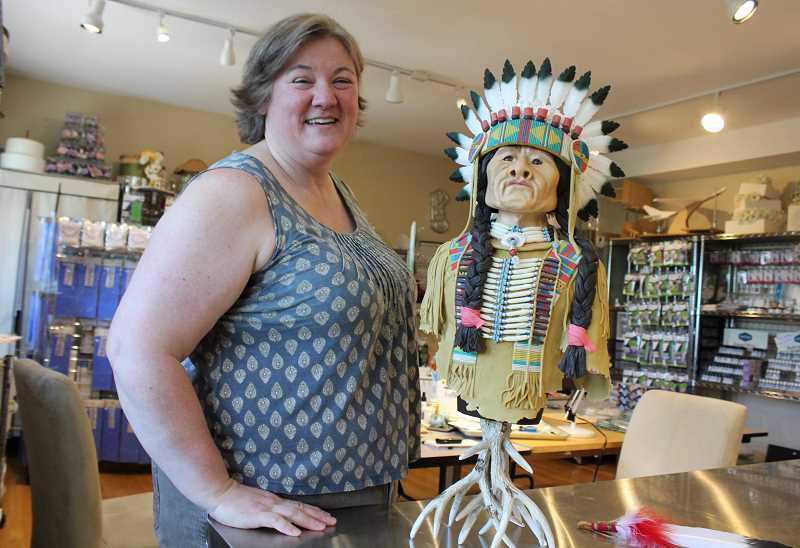 She took home four awards, including best of show, winner of the professional division, winner for novelty/sculptured items, host choice and first place for professional novelty sculpture for her cake titled "The Chief." Standing at 29 inches tall and weighing 17 pounds, "The Chief" is a 90-percent edible cake sculpture inspired by Foster's connection to and appreciation of the Native American tribes of Oregon. From hand-rolled beads, a headdress adorned with feathers, a leather shirt and a brightly colored vest, Foster spent 150 hours over the course of seven days perfecting "The Chief." She created the piece using sculpting ingredients like modeling chocolate, rice noodles, fondant and gumpaste. Each aspect of the cake was crafted by hand using an incredibly focused and keen attention to detail. "Everything on him is made by hand, except I used a mold for the feathers, which are sugar," Foster says. "I'm adopted and my family is American Indian, so that's what sparked my interest. My adopted parents live in New Mexico, and I've seen these beautiful outfits they wear for celebrations. To me it was the perfect (subject) because of how elaborate everything was." To the naked eye, Foster's sculpture looks complete, but she's continuing to work on "The Chief" over the next several weeks to include aspects she didn't have time to finish. "I used my cousin Bev, who is super involved with her tribe down in Florence, to research and learn as much as I could about the meaning behind each piece of clothing," she says. "It was really important to me that I got everything right and learned about what it all means. It was kind of sad how little information there was out there regarding the history and culture behind some of these traditional clothings." While she's proud of her accomplishments, Foster isn't one to rest on her laurels. While it's hard not to get attached to a piece she's put her heart and soul into, she says she's always thinking about the next one. Moving forward, she has a long list of projects to finish in the coming weeks, as well as preparing ideas and design concepts for the Oregon State Fair at the end of the summer, where she'll submit another competition sculpture. "Winning was quite exciting, I'm not going to lie. I'm pretty proud of it," she says. "I think I'll take (The Chief) to the state fair to display, and then at that point dismantle him." For more information about Foster or her business, visit http://www.lesliescakeroom.com.